From its opening words proclaiming that God created the heavens and the earth, to the closing words where John prays for the Second Coming of Jesus, the Bible shares a God who is involved with the physical world. But of all his actions recorded, none are more important than the resurrection of Jesus. So Paul can tell the Corinthians, “if Christ has not been raised, your faith is futile and you are still in your sins. Then those also who have fallen asleep in Christ have perished. If in Christ we have hope in this life only, we are of all people most to be pitied” (1 Corinthians 15:17-19). It is no surprise, then, that the so-called “new” atheists have targeted this miracle of all time, seeking to dislodge it from history. People like John Dominic Crossan, Robert Price and Matthew S. McCormick (among others), have sought to pick up the mantel (to use a biblical image) of David Hume and deny the factuality of Jesus’ resurrection. There is nothing new about this effort. It began within a week of the actual event (Matthew 28:11-15). However, just as there have consistently been those who deny history, so there have consistently been those who have defended the historicity of the physical resurrection of Jesus (1 Corinthians 15). The Resurrection FACT is another addition to the contributions made by the defenders of reality over the centuries. The Resurrection FACT is actually a collection of eight papers, written by eight highly qualified individuals, collected into this volume by the editors, Bombaro and Francisco. Bombaro and Francisco each contribute one chapter. Each contributor brings their expertise to bear on a particular opponent of the history of the physical resurrection of Jesus. Perhaps the most challenging chapter is chapter 6, “Un-Inevitable Easter Faith: Historical Contingency, Theological Consistency, and the Resurrection of Jesus Christ,” by Jonathan Mumme. That is because he uses technical terms the most. An excellent feature of this chapter is Mumme’s consideration of just what it means to be fully human. Perhaps the most fun chapter to read is chapter 4, “The Case against The Case against Christianity: When Jerusalem Came to Athens,” by Craig S. Parton. It is presented as a panel discussion between “new” atheist Michael Martan and first century individuals that Martan consistently misrepresents. Another feature of this book is that it doesn’t simply contend for the physical resurrection of Jesus. It also explores its meaning (hence Mumme’s consideration of just what it means to be fully human). This makes the book a worthwhile read, even if you already know that Jesus really did physically rise from the dead. Because the book is focused on the physical resurrection of Jesus (and not other miracles in the Bible) the writers can be more detailed in their examination of the topic. Because each chapter is actually an individual paper, each chapter can stand on its own. The footnotes are excellent. All but one chapter ends with a list of books for additional reading. 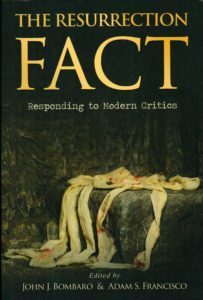 I recommend The Resurrection FACT to anyone who has been impressed with the argumentation against the actual physical resurrection of Jesus by the “new” atheists, to anyone who finds themselves confronted by people who attack the actual physical resurrection of Jesus with the arguments of the “new” atheists, to anyone who is interested in defending the historic Christian faith in the historic physical resurrection of Jesus, and to all who would simply like to revisit and firm-up their understanding of this central event in history. But the ones who might benefit most from The Resurrection FACT are those who have no idea who the “new” atheists are and watch television specials at Easter time where they trot out “experts” on the Bible and history and these so-called experts assure the viewing audience that the physical resurrection of Jesus didn’t happen. Such so-called experts, no matter what academic letters follow their names, betray both history and God.